Barbara began her business out of a desire to create unique, original clothing for children and it all began with just a few sewing classes to get her started. Tenacity is a good trait and Barbara's careful choice of fabrics are certainly on point. Krista Engler of North Charleston, South Carolina incorporates soy wax into her hand dyes and adds bold, graphic shapes to the design. Simple and soft and they make a statement. Hard to pass on by... See Krista's current collection for sale, here. This is the Grant Tote. It's hand stitched with waxed thread (which takes about a dozen hours) and finished with antique brass hardware. As you can see, Erik has a knack for creating items that are purposeful and functional yet with a minimally beautiful end result. It's been a long while since I've had a lunchbox but after seeing the recent beautifully designed boxes by Charleston artist, Lulie Wallace, I want one. Just like this. Lulie created her own lunchbox out of need. 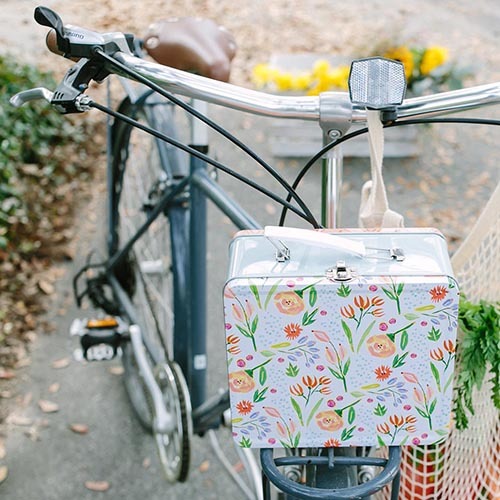 She brings her lunch to the studio every day so she figured, why not make it stylish? You may remember Lulie from her gorgeous paintings, which I blogged about a couple years ago...so I'm happy she's found new and functional uses for her pretty designs. Pick your favorite, here. A couple of days ago, my friend Antonis said he needed help finding a man tote. Something light, easy to fold up but still stylish and masculine. I decided he needed the chambray tote by Charleston based artist, Erik Holmberg of Starkmade. Erik also crafts a series of more durable totes, both thin and wide. It's a good selection that hopefully can appease the pickiest of male shoppers. His work continues to impress me- as he began his shop by crafting leather goods like this gorgeous Franklin bag, but has since expanded his wares to include an impressive collection of bags, wallets, belts and pocket squares. Check it out for yourself, here. When my friend Nan of Firefly in Thomasville, Georgia speaks highly of a new product in her shop, I listen. She has superior taste. 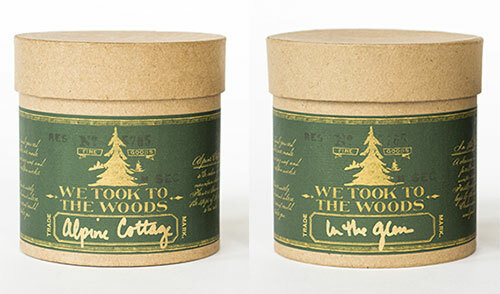 Which is why I can't wait to try one of these We Took to the Woods candles, per her suggestion. They're earthy and cozy- perfect for today actually. It's the first day of fall. The sleek and distinctive letterpress map (with shiny gold foil) divides the Charleston peninsula into its various neigbhborhoods. As Jackie has shared, she loves "clean lines, simple yet impactful design along with the hint of the unexpected." Someday when I have a new place with lots of natural light (I barely have any now, sadly) I aspire to own some colorful art that matches the happy feeling I get when streams of light fill my home. 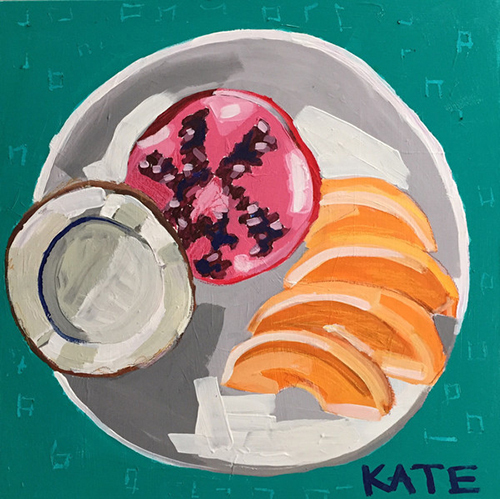 So, I think the first order of business will be to buy a painting by Charleston based artist, Kate Waddell. 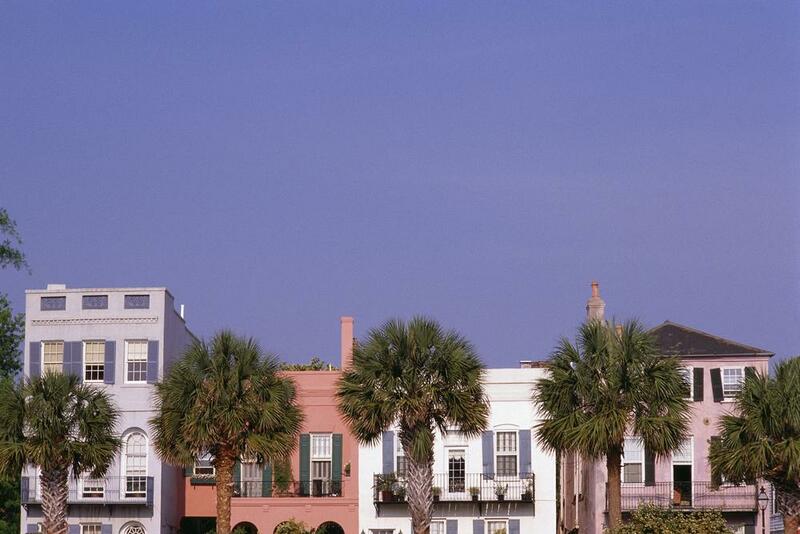 Kate was born and raised in Columbus, Georgia before moving to Charleston for college and calling it her home. I love her distinctive broad stroke paintings in acrylic and gauche. Subjects range from animals and still lifes to nudes and portraits - she's such a talented one. After spending much of last week in Charleston, South Carolina, I was happy to discover some local, new artists to blog about on Sweet Peach- one of which is Caitlin Pape of Rose + Twill. With a love for graphic design and crafting, Caitlin has found a nice niche for herself. Her vibrant colored quilts are beautifully thought out and executed. I love her aesthetic, as each and every fabric combination seems spot on, don't you think? All of Caitlin's quilts are heirloom quality and machine washable, plus she'd be happy to make a custom one of your liking. Just drop her a line, here. 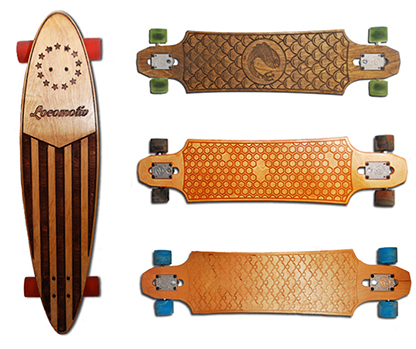 Each board made at Locomotiv is made from a high quality hard maple and carved with a unique design for extra style and grip. 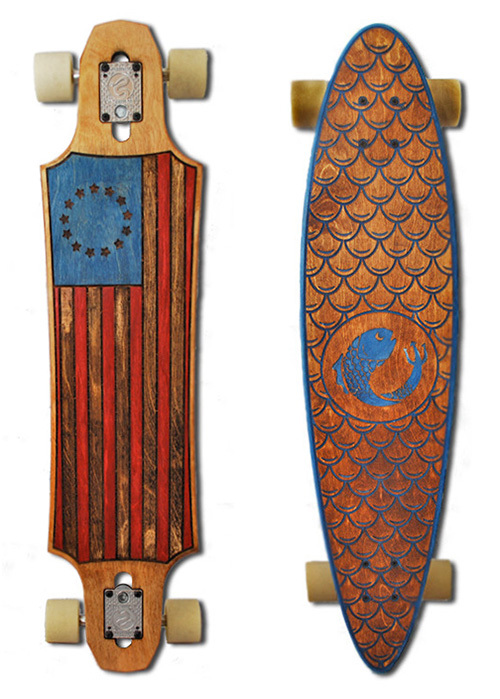 On all the boards, you can also customize the base and accent stain, as well as the color of the wheels. A perfect purchase to start the spring...check out all the Locomotive Boards, here. Her utensils are shaped by hand- a labor intensive process that, depending on the piece, consists of carving the wax, casting the molds, forging, soldering, casting and finishing. Each is an original and a true treasure to have in your very own home. 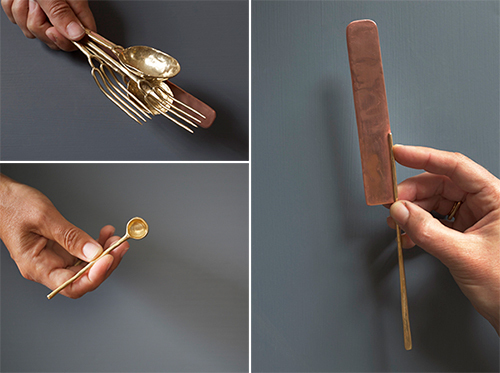 In this set of pics, you'll find a spice spoon, an oyster spork and brass tea spoons. As Ann was once a pastry chef, she is very atune to the needs of a chef. The right tools make a world of difference- plus it can't hurt that they're also this lovely. Still gushing over the shiny spoons, I find myself fawning over her solid brass three legged candlesticks and tri-ped bowls. As Ann notes, these tiny bowls work just as well for your spices as they do your jewels or small keepsakes. A brass dinner fork and a tiny ladle? I can't take it, I just can't take it anymore. It's all so beautiful and so fun... another strong reminder that I need to stop just thinking of Charleston and return to this enchanting southern city very soon. See the entirety of the Ann Ladson collections, here.